This beautifully made and excellent value instrument has a solid rosewood body that lends itself to the soft gentle curves of this sixteen string lyre harp. The sixteen metal strings provide a classical sound that is enhanced by the solid spruce soundboard. Hold it upright on your lap or as you walk, and pluck both sides of the strings. Or lay it flat and pluck it. Tuning tool and padded bag included. The oldest known depiction of a Lyre is dated to 2800 BC in Sumeria. The basic design of a lyre is a sound box, or resonator, with two arms connecting a crossbar, and having strings that run parallel with the length of the instrument. The Sumerians held the lyre vertically, with the crossbar at the top. The Egyptians played their lyres with the crossbar pointing out away from their body. The lyre was also known to the ancient Greeks. It was said that Hermes, the messenger of the gods, made the first lyre from a tortoise shell. The use of the Lyre was widespread in the ancient world. In the present day, the lyre is limited almost exclusively to parts of Africa and Siberia. Across time and geography the lyre has changed in many ways. The number of strings, how the instrument was held, and whether it was plucked, strummed, or played with a plectrum has varied. Depending on the style and size, lyre strings have been played from one or both sides. 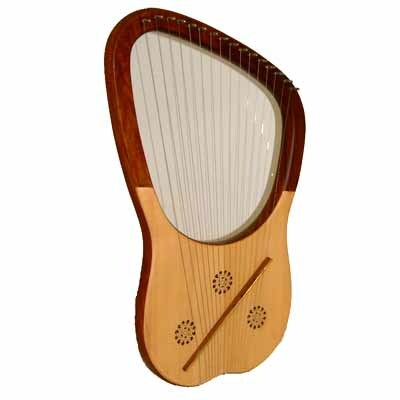 This beautifully made and excellent value instrument has a solid rosewood body that lends itself to the soft gentle curves of this sixteen string lyre harp. The sixteen metal strings provide a classical sound that is enhanced by the solid spruce soundboard. Hold it upright on your lap or as you walk, and pluck both sides of the strings. Or lay it flat and pluck it. Size: 62 x 38 x 5 cm.